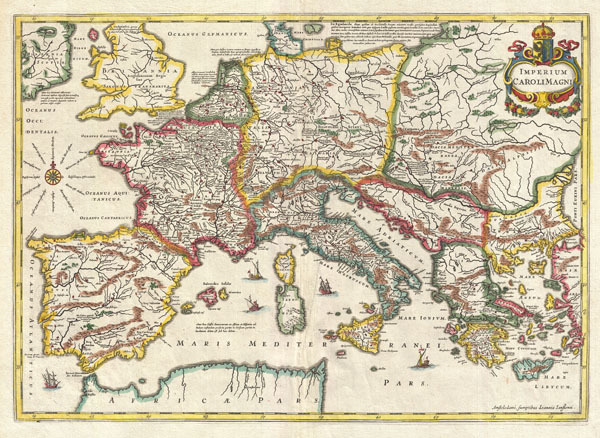 This is a remarkable example of Jan Jansson's 1657 mapping of the Empire of Charlemagne. Covers from Spain to the Black Sea and from Denmark and Ireland to North Africa. Filled with copious notations in Latin. Decorative sailing vessels ply the Mediterranean. A decorative title cartouche appears in the upper right quadrant. This remarkable map was published in volume six, the Orbis Antiquus, of Jan Jansson's Novus Atlas. Very good. Exceptional dark impression. Blank on verso. Keuning, J., 'The Novus Atlas of Johannes Janssonius', Imago Mundi, Vol. 8 (1951), pp. 71-98, no. 489.